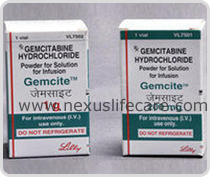 Uses:- Gemcite Injection is used to treat certain types of cancer (including breast, lung, ovarian, pancreatic). Gemcite Injection is a chemotherapy drug that works by slowing or stopping the growth of cancer cells. It may also be used to treat certain other cancers, such as bladder cancer. Side Effects:- Nausea, vomiting, diarrhea, pain/redness at the injection site, and flu-like symptoms (e.g., fever, muscle aches) may occur.